Neue Klasse und Kaffee is a monthly gathering for the BMW Neue Klasse cars in the San Francisco Bay Area organized by BMW 2002 FAQ. We meet on a third Saturday of every month between 8:00am and 11:00am at either Back Yard Coffee in Redwood City, CA or Chromatic Coffee in Sunnyvale, CA. We alternate the location monthly. We are small group of people who enjoy our cars as much as we enjoy the conversations with other fellow drivers. 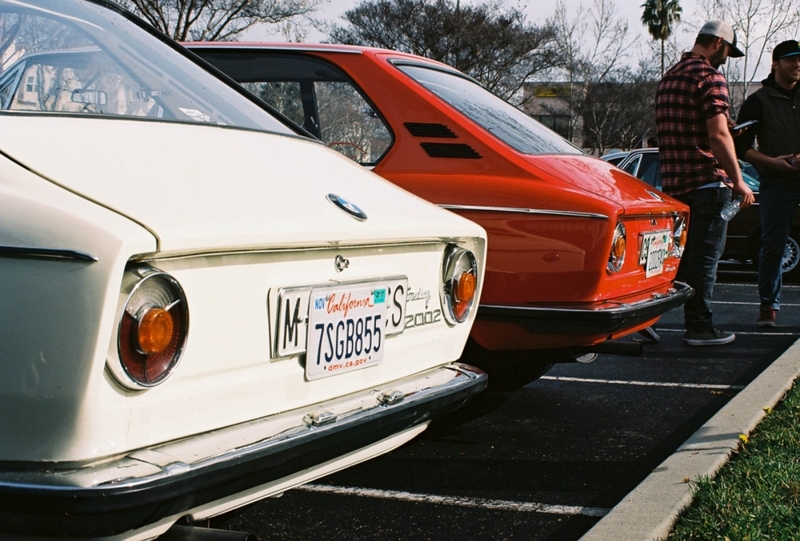 The gathering gets a large number of BMW 1600s, BMW 2002s, Tourings and other Neue Klasse cars. Other manufacturers are welcome, especially if you have something classic. 500 Sierra Point Parkway-- along the Bay on the North side of Sierra Point. Preregister on Motorsportreg (see below). Preregistration is $25 while the on-site fee on 4 May will be $30. Graphic artist Kile Brekke has again added his art to our T-shirts and printed materials; we think you will be delighted with his design! Please preregister early to help us plan for the best number of each shirt size. We will have a named bag for each preregistrant so our closing date is slightly earlier than some years to help us organize the bags. Note— Swap & Show visitors are welcome! There is no fee for entry if you do not show your car or swap parts. However, we encourage anyone with a BMW of our vintage to bring your car to display, no matter how mundane your daily driver (dirt, rust and all) or how beautiful your restoration. Swap & Show does not judge your car so there will be no points for extra dirt, missing dirt, matching luggage or concours glow. We smile at all BMW's and photographs or videos are welcome (but NO drones over cars)! Preregistration is now open, until Tuesday, 30 April. Go to [Preregister for Swap & Show 2019].